We visited Sisters again this week. My apologies to any readers who live in that town, for not giving earlier notice. There does not appear to be a Tea Room there but the town certainly should have one; maybe something with a 19th century western theme. We did take a little snack and hot tea with us, and were pleased to find this pretty cup. It possibly was made in the 1970's. When buying to actually use daily in your home and for serving hot beverages to other people, do not buy teacups that are too old. I avoid rare brands and rare teacups because they will be too precious to use, and it will end up just being a collection. I like to use the cups, so I collect the most common, and newest that are considered fine china. Cups made in the 60's and 70's are very pretty and strong enough, not too delicate for using. People have asked me what is the best kind of teacup to buy. After years of experience serving tea, I have to say the best kind are NEW. I get these from discount places (where they sell salvage and seconds) like TJ Max (Home Goods), Marshalls and Ross. These are often under $5.00 for a cup/saucer set. 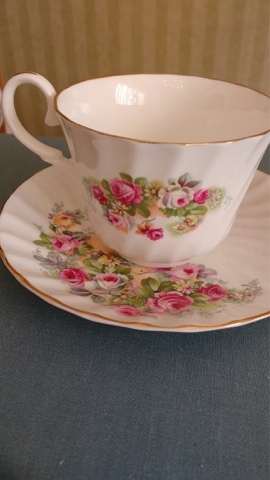 The older tea cups are an average of $15.00 in antique stores, but I have seen them for $5.00 in resale shops and charity shops. Without consulting a book, you may be able to tell how new the cup is by the type of printing on the back. The newer it is, the clearer the print and the more uniform. There are other markings that indicate how old a cup is. If a tea cup is made in Japan it is probably older, and I would not buy it unless it were recently made, because I want to use it. Not all new cups are good. Avoid the ones that feel heavy, weighed down with lead. If it is light weight and feels delicate, the tea tastes good in it. I like the new teacups because they do not have the gold rim on the drinking area, as this often can be worn off or chipped. I do not mind it on the 1970's cups, though, and tea is good in them and they are easy to wash by hand. Make a paste of baking soda and water, and rub away stains with a wet dish rag. The new cups on the market are very pretty and are dishwasher safe. They do not break as easily as older cups, and if broken, it is is no great loss and they are easily replaced. You can have a very handsome set of China from the discount stores I mentioned, and they make really good wedding gifts, and friendship gifts. I wash teacups by hand using soda bi-carb and a dish rag to remove any tea stains. Usually I buy them locally because I can touch and feel for any flaws along the rim. I notice if the glaze or shine is worn on the rim. 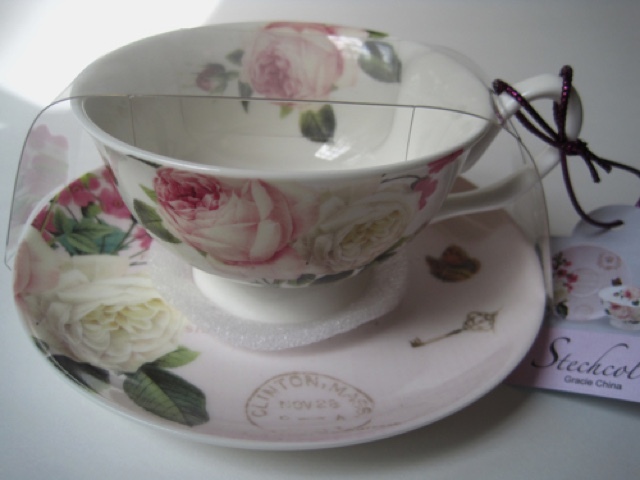 Online, if a seller is not really a tea person and does not use tea cups personally, they will not notice everything. They will say the cup is without cracks or chips or stains, but sometimes not recognize how faded the picture on the cup is, because they never saw an original, new set of that pattern. Another thing I look for in choosing a teacup is the handle. Some handles are too small to grasp, or too delicate. The handle is usually the first thing to break. If you want to send her an encouraging card, please email me for her mailing address or email. My email is on the contact area on the left of this blog. She would appreciate some encouraging cards, if any of you have time. Thank you all very much for the prayers. Tea Cup from Home Goods/TJ Max, approximately $3.95. 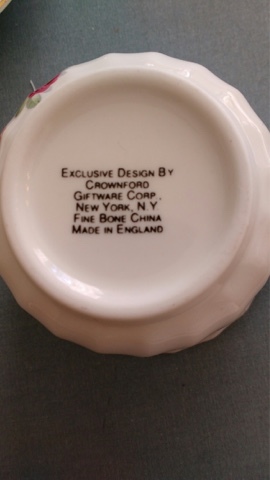 It is t fine china but you can use it and not have to worry about it being too rare or delicate. This is very helpful advice, Lydia. Thank you. Very good information Lydia, and a beautiful teacup too. I would like to add info on finding a teacup. Never buy a cracked teacup for drinking hot tea. It may come apart with hot fluid in it. Some cracks are hard to see. I always hold a teacup by the handle and give the teacup a peck with my fingernail. If it has a "thack-thack" sound when pecked, it is cracked and should not be purchased for drinking hot tea. If it has a "ting-ting" sound, it is whole and safe for drinking hot tea. Doing this will prevent one from spending good money on a teacup that isn't safe. I hang them on a shepherd's hook in the garden for decoration, the saucer set below in display. Very pretty with garden flowers. In the Winter I place a bit of gravel in the bottom if teacup and place a bulb in teacup, add water and wait for Spring blooms. 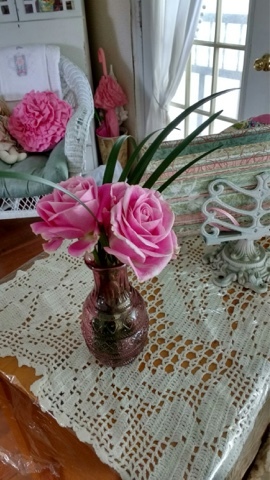 Very pretty for a Spring Tea Party or to cheer a shut-in. 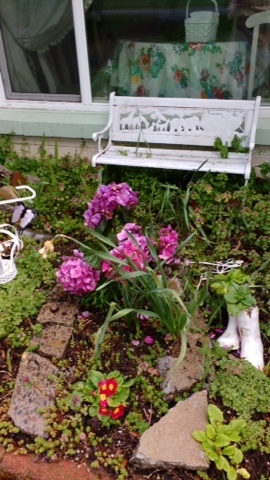 Bits of broken china and teacups may be used for mosaics in garden furniture. All sharp edges down. 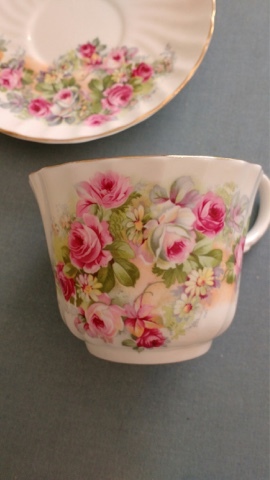 Speaking of cracks, some sellers bleach the cups so the yellowed cracks do not show. Your thumping test is a good hint. There was once a wonderful two-story tea shop in Sisters with teas, teapots, etc. sold on the ground floor, tea, soups, sandwiches, etc. sold upstairs. However, it was only open a few years and then closed! I loved it and have missed it greatly. There is a Townsend's in downtown Bend which has great tea and/or coffee with pastries.